Here’s what you can expect to see from Mercedes at the 2019 Geneva Motor Show. The 2019 Geneva Motor Show is just around the corner, with the doors to the Swiss expo open to media on March 5. We’ve seen automakers start to release teasers previewing new models that will debut at the show, and now Mercedes has confirmed which models we can expect to see make their world debut on the German automaker's stand. 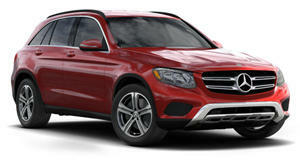 One of the most important model debuts from Mercedes will be the new facelifted GLC SUV. Judging from previous spy shots, the popular SUV will receive some subtle styling tweaks including new headlights with LED daytime running lights, a revised grille, and new front and rear bumpers. After all, Mercedes won't want to risk messing with a successful formula. Mercedes has also confirmed the new GLC will boast an updated interior with an MBUX infotainment system and gesture control, as well as a revised engine range. The new GLC won’t be the only new Mercedes model debuting at the show, however, as the covers are also coming off the stylish CLA Shooting Brake to complement the Coupe. Like the Coupe version, it will be powered by a 2.0-liter turbocharged four-cylinder that sends 225 horsepower and 258 lb-ft of torque to all four wheels through a seven-speed dual clutch transmission. Unlike the Coupe, however, the CLA Shooting Brake probably won’t be going on sale in the US, much to our dismay. A new Concept EQV will also be revealed at the show to preview a fourth model joining the automaker’s electric EQ range. Mercedes describes the EQV as the "world's first SUV in the premium segment with purely battery-electric drive.” In addition, the new V-Class will make its show debut at the Geneva Motor Show. Three special-edition models will also be on display: the SL 500 Grand Edition, the SLC 300 Final Edition, and the S 65 Final Edition, with the latter marking the end of the 6.0-liter twin-turbo V12 engine being used in the S-Class. Finally, Mercedes’ Formula E show car and the Smart Forease+ concept will be publicly displayed for the first time.